To check our actual offers in Florence, please use the white form above. Just enter the desired dates, time and pick-up/return location. The most recent car booking in Florence has been made on our website 4507 minutes ago.. In Florence, we offer for rental 9+ car categories from 26+ rental suppliers. 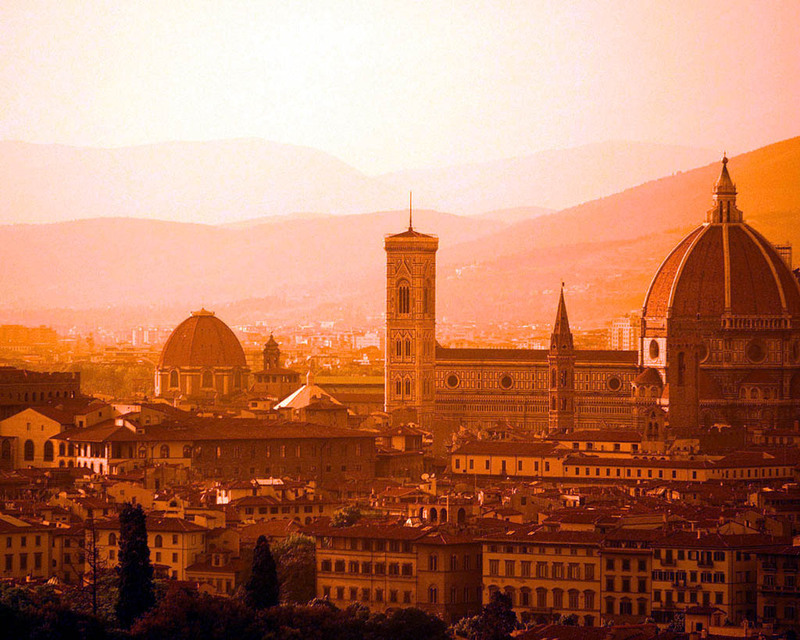 With OrangeSmile, an early booking is the best way to save on rental costs, since our car rental rates in Florence increase with approaching pick-up date. While our confirmation arrives just in 5-20 minutes, we advise to make your booking in Italy at least a few days before the desired rental date. Prior to making a booking, carefully read the rental conditions for the selected car in Florence. Knowing the actual conditions helps to avoid surprises at the rental desk. Make sure that you know at which exact location in Florence the car should be picked up - for this, check the address in your voucher. In some cases, rental companies in Italy meet their clients in a pre-defined spot (e.g. fuel station). However, commonly you should just register at the front office. Valid credit cards are accepted for payment by every rental office in Florence. In general, car rental companies in Italy do not accept cash, debit cards and e-cards (VISA ELECTRON). The documents provided to you in Florence by the rental officer should be carefully inspected. Check the car type, payment amount, taxes, included services and Italy border crossing conditions. In case of inconsistencies and problems detected, call us by the number specified in the rental voucher. 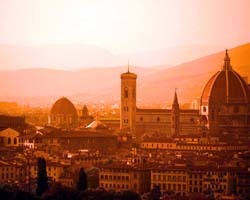 We, at OrangeSmile.com, wish you a fantastic time and experience in Florence! Despite its quite modest status, Hotel Berna is known as one of the most elegant and popular hotels in Florence. It is located approximately 300 meters away from Santa Maria Novella railway station. In Hotel Berna, guests will find amazing rooms with a unique decor in retro style. Wooden furniture with bright upholstery, giant mirrors and elegant tables, high rise beds with carved headboards and charming lamps – a stay in such an aristocratic atmosphere will absolutely not drain your wallet. Every morning, the hotel offers a delicious buffet type breakfast with fresh croissants, sweets, and fresh fruit. Located not far from Uffizi Gallery, Hotel degli Orafi is open in the former Augustinian monastery built yet in the 13th century. This hotel will be liked by romantic travelers who enjoy modern style hotels. The roof of the building has been turned into a special relaxation area with a small garden and a bar. Spacious terraces of the hotel feature great views of the Ponte Vecchio Bridge and surrounding landmarks. Guest rooms at Hotel degli Orafi have the original ancient beams and frescos. The design looks solid with premium carpeting and branded furniture in bright colors.